An unusual view of the smokestacks from 1939 — in color! 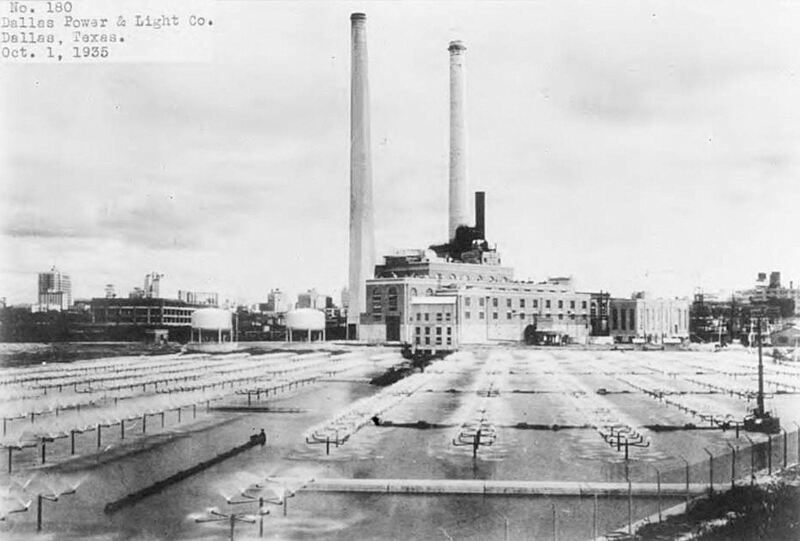 According to The Dallas Morning News, the Dallas Power & Light Company power plant had been in use at the location at “at the foot of Griffin Street … since 1890, with additions in 1905, in 1912 and in 1914. 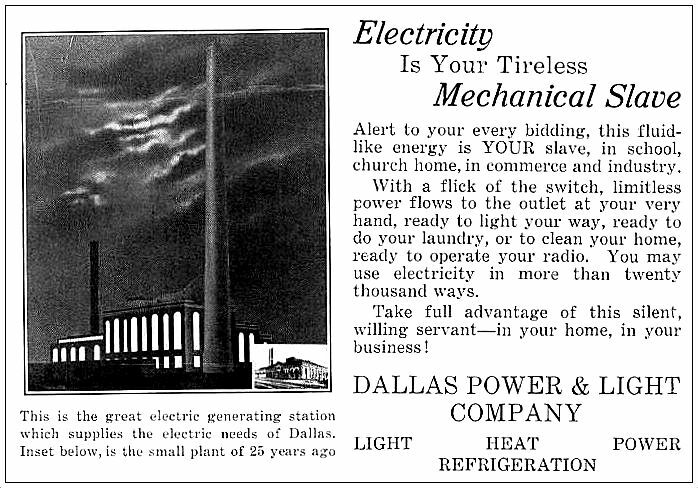 In 1922 work started on the most recent addition, which when completed will cost over $2,000,000, and will provide additional generating capacity of furnishing 20,000 kilowatts” (DMN, Oct. 14, 1923). 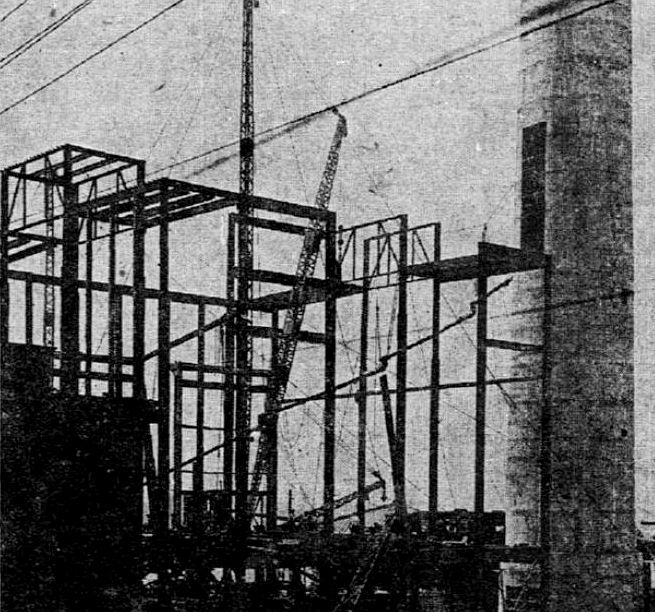 Construction on the new addition — including the first of the two new smokestacks — began in the summer of 1922. 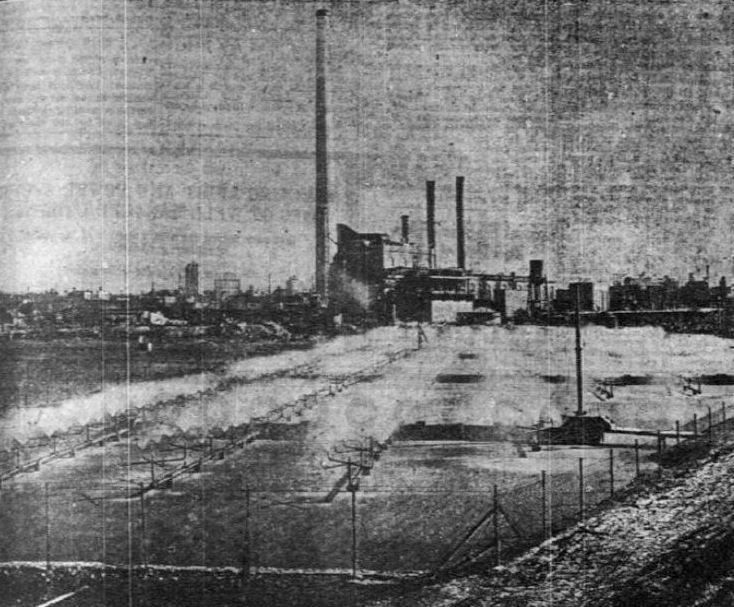 By the summer of 1923 the first smokestack was partially built. 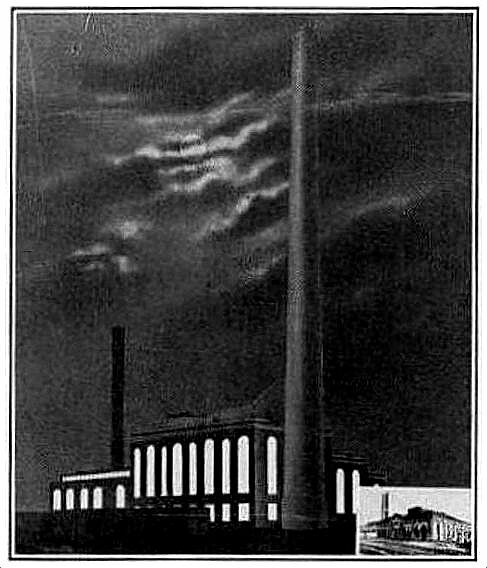 And in 1929 … voilà — the second smokestack! 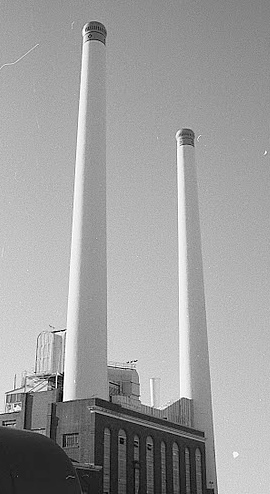 Those two smokestacks (which actually emitted steam rather than smoke) were almost as much a part of the iconic Dallas skyline as Pegasus. 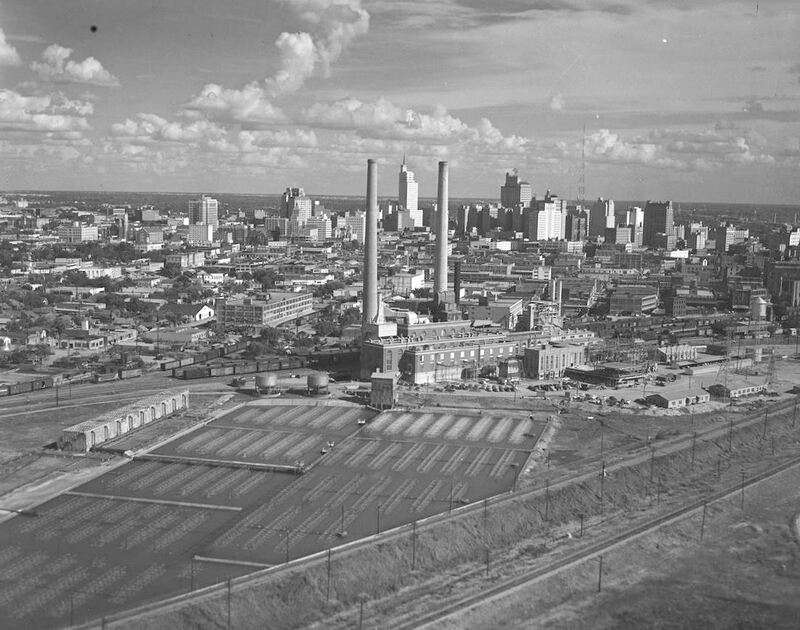 You’ll see them in any wide shot of the skyline taken between 1929 and the late 1990s, when the plant was demolished to make way for the American Airlines Center (the design of which actually is reminiscent of the building it replaced). You could see those smokestacks from miles away, and, even though they’ve been gone for more than 15 years, I still expect to see them standing there. RIP, smokestacks! 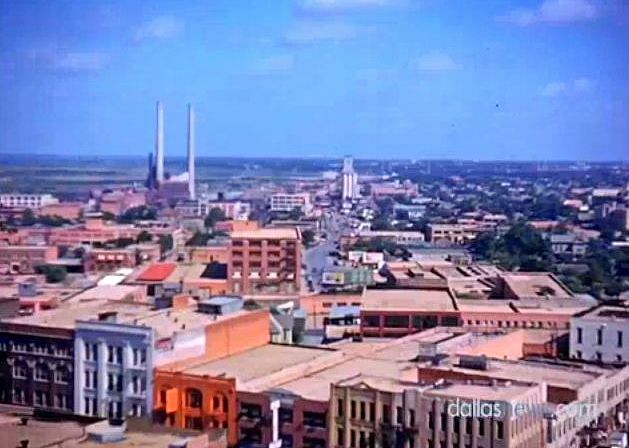 Color image is a screengrab from the short 1939 color film of Dallas which you can watch in full, here. Ad is from the 1928 Terrillian, the Terrill School yearbook. 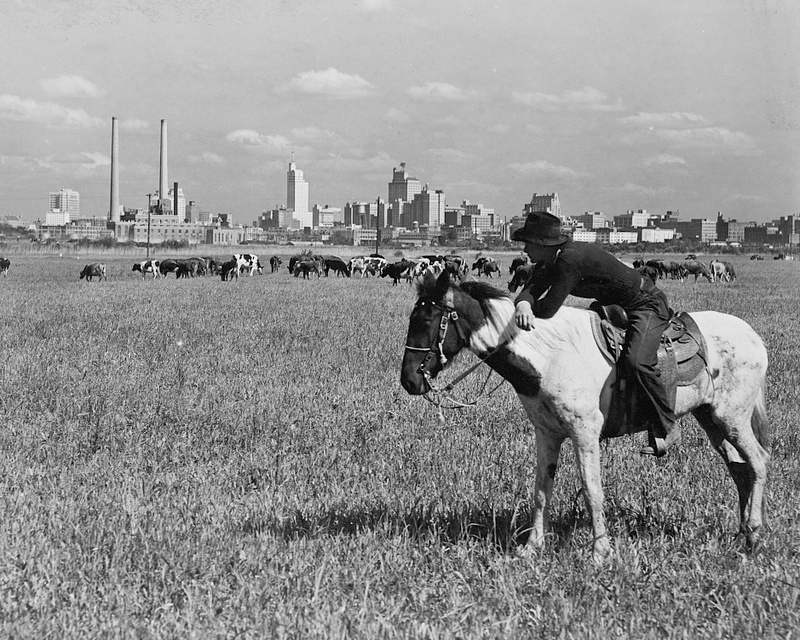 William Langley photo of the cowboy on horseback is from the Library of Congress, used previously here. 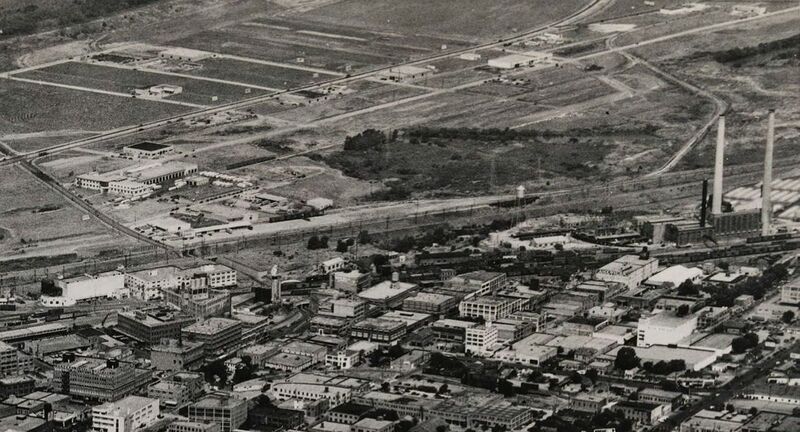 Lloyd M. Long aerial photo is a detail of a photo cataloged as “Downtown Dallas — looking west,” from the Edwin J. Foscue Map Library, Central University Libraries, Southern Methodist University; the full photo and its details are accessible here. 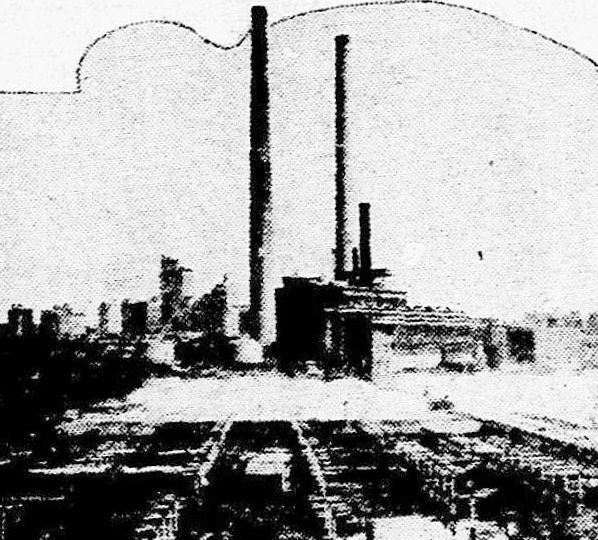 The Dallas Steam Electric Station on Stemmons is nearly a century old and for most of that time it has been a commanding presence on the downtown skyline, its soaring white smokestacks rivaling anything that modern skyscraper designers have come up with. In Pittsburgh or Detroit such a structure might pass unnoticed but in Dallas, never a factory town, it stands out as a romantic symbol of our earliest industrial aspirations. (My favorite piece of trivia from Dillon’s article is the revelation that the “tapering white shafts and gold caps [were] touched up every few years by daredevil painters lowered from a helicopter…” (!)). 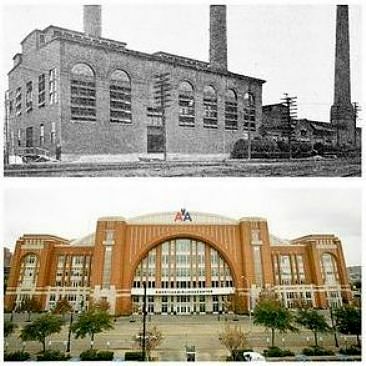 More about this plant (and how it lives on in the design of the American Airlines Center which now stands on the same land) can be found in the Flashback Dallas post “A New Turbine Power Station for Big D — 1907,” here. As always, most images are larger when clicked. When in doubt … CLICK! That is where the mythical Frog town began and the old town dump, dating too the 1870s, Flynn Brothers owne the land at one time and Frog Town moved by the late 1880s to the Law street area and so by 1900, the town dump continued until the 1908 flood, while the second plant was built around 1919,while the rivers edge was in that area until the mid 1930s. Jim Wheat found the old Hengy Junk yard adds for that location…D.P.and L was a historic landmark, that had too go while it was ithe 1990s that they designed the present Victroy Arena area which was too come about by 1998…99, and completed by 2004. Then in 1998 the 76 acres of land including the Frog Town area was removed too Lewisville too a land refill area and layed too rest the city history in old dump refuge, millions of artiacts were lost and the story of how did the city come too exist in archeologicl trash is now missing , oh well the images here tell of a great viewpoint that had for decades covered the skyline and when the freeways came in the view point was quite impressive, and yet toxic…. .great story because a new skyline now exist in the ever changing Dallas Texas,,…..more on this great story should be told because that was the most seedy part of town much like Deep for decades in the 19th century. Thanks, Alex. I was thinking about the Hengy post I did a few months back when I wrote this. there is one Hengy landmark left in Fair Park across from 500/X gallery, as the electrical company. while they were the rag, bottle and metal junk men, their story is about frog town and they used too live in Little Mexico off Wolf street, their story is the character that tells all of carnival people from that era. as the Hobos lving inthe area up toothe 1960s by D.P. and L, there was a big hobo comp there for decades…..
GARY DON GROOM,I OPERATED 7 350LB BOILERS ON THE OLD SIDE,1971 TO 1976.FOND MEMORIES, LONG CAREER 41 YEARS.IT WAS LIKE WORKING IN A MUSEUM . Thanks for the comment, Gary Don. I would love to have seen inside there!